The Amazon rainforest is home to an incredible number of the earth's plant species. On average, the rainforest gets nearly 9 feet of rain per year. However, because of the huge number of plants growing in the rainforest, the soil is relatively poor, making it a very fragile ecosystem. The top 2 inches of soil contains 99 percent of nutrients available to plants growing in the Amazon rainforest. The Amazon contains 2,700 species of bromeliads. Of those, about one-third are endangered. Those endangered bromeliads are rare in their natural environment. Bromeliads are a very diverse family of plants that include pineapples and Spanish moss. They are made up of spiral arrangements of leaves and generally grow in a flat, round configuration. One of the Amazon rainforest's rare, endangered bromeliads is the Portea Leptantha. The Portea Leptantha only grows above the São Franscisco river in Brazil. Another Amazonian bromeliad that is on the Convention for International Trade in Endangered Species (CITES) list of banned plants for export is the Tillandsia xerographica. Although at first look, it would appear that orchids in the Amazon rainforest are not rare, most of the 25,000 species are either threatened or endangered. Each individual species is rare, but with 25,000 species it can look as if orchids are doing fine. Although some orchids grow on the ground, about 70 percent are epiphytes, meaning they grow on trees. Individual orchid species are closely tied to their unique biome. For example, some orchids can only be pollinated by a specific insect. If that insect disappears, the species of orchid it pollinates will also disappear. Kapok trees in the Amazon can grow to 150 feet tall. The kapok fruit is the source of fibers that are a natural alternative to cotton or polyester fibers. Kapok trees have become rare and are now considered endangered. Because of their size and place in the Amazon rainforest, the kapok tree offers food and shelter for many species of insects, birds and animals. As it becomes rarer, the other wildlife the tree supports comes under stress. Although it is more closely associated with the rainforests of Asia, the rafflesia flower is found in the Amazon, although it is very rare. 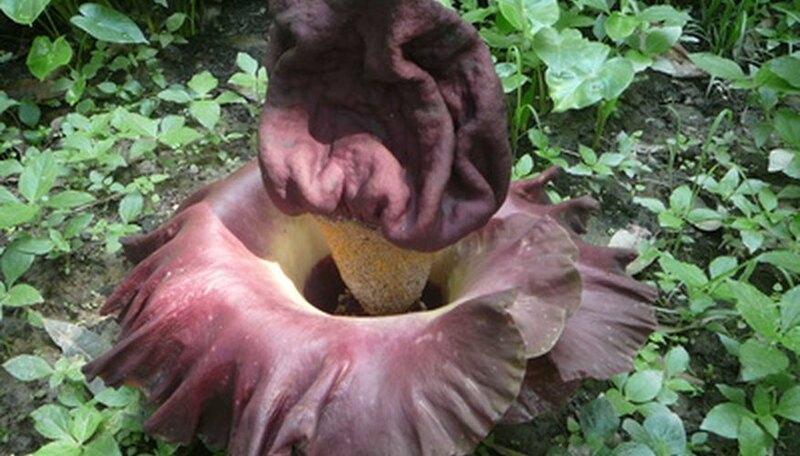 Endangered everywhere in the world, including the Amazon rainforest, it is the largest flower in the world. The flower is parasitic. It has no leaves. Its tap root extends down to absorb nutrients from its host plant. Sometimes called the "corpse flower," this flower emits an odor of rotting flesh to attract flies for pollination. Bromeliad Society International: What are Bromeliads? Although he grew up in Latin America, Mr. Ma is a writer based in Denver. He has been writing since 1987 and has written for NPR, AP, Boeing, Ford New Holland, Microsoft, RAHCO International, Umax Data Systems and other manufacturers in Taiwan. He studied creative writing at Mankato State University in Minnesota. He speaks fluent Mandarin Chinese, English and reads Spanish. What Are the Different Types of Cacti Living in Mexico?